Israeli soldiers abducted, on Tuesday at dawn, four Palestinians from their homes in Ramallah, in central West Bank, and Nablus, in the northern part of the West Bank, during extensive and violent military searches of homes. The soldiers invaded Budrus town, west of Ramallah, and fired many gas bombs, concussion grenades and rubber-coated steel bullets at local youngsters, who hurled stones at invading military jeeps. The army invaded and searched homes in Budrus, and detained Mustafa Nabil Awad, who was released later after the soldiers interrogated him. Also in Budrus, the soldiers assaulted many women and men, after one of the military’s jeeps broke down, and dozens of additional soldiers invaded the area to retrieve it. 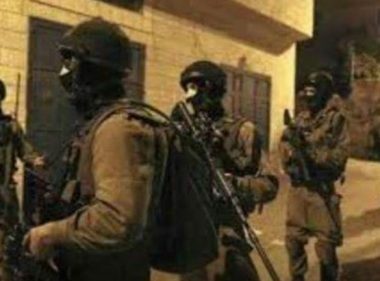 Furthermore, the soldiers invaded homes in Awarta town, east of the northern West Bank city of Nablus, and abducted Abdullah Abdul-Hafeeth Awwad. One of the homes belongs to the family of Samer Awwad, who was killed by the army on July 28th, 2002. In addition, the soldiers abducted Baha’ Marshoud and Ahmad Marshoud, from Balata refugee camp, east of Nablus, after stopping them at the Huwwara military roadblock, south of Nablus. In related news, the soldiers abducted twelve Palestinians, including five young women, in several parts of occupied East Jerusalem. In Hebron governorate, in southern West Bank, the soldiers abducted a teenage boy from Surif town, northwest of Hebron, after invading his home.